‘Turner & the Age of British Watercolour’ has just opened at Petworth House and runs until 12th March 2017. The exhibition celebrates the British pre-eminence in the medium of watercolour painting in the mid-18th and early 19th century. The work is predominately drawn from the Cecil Higgins Art Gallery, Bedford, and includes a breadth of artists and paintings of extraordinary quality. Curated by Andrew Loukes of the National Trust, the exhibition illustrates the development of the British watercolour tradition century and its role in establishing our national and patriotic identity. The story is told with JMW Turner at its centre. Although Turner painted numerous watercolours at Petworth his great patron and friend, The 3rd Earl of Egremont, did not acquire any. This jewel-like show brings watercolours to Petworth House which speak into the ravishing house collection. The exhibition makes apparent how British watercolour painting moved from recording the topographical to a romantic, personal impression of a particular place. Many argue that the poetic landscape of the romantic imagination is born out of Constable and Turner’s work. It was Dr Thomas Munro, the chief physician at the Bethlem (Bedlam) Royal Hospital, who identified the genius of the artist John Robert Cozens. Cozens was admitted to the asylum suffering a nervous breakdown. 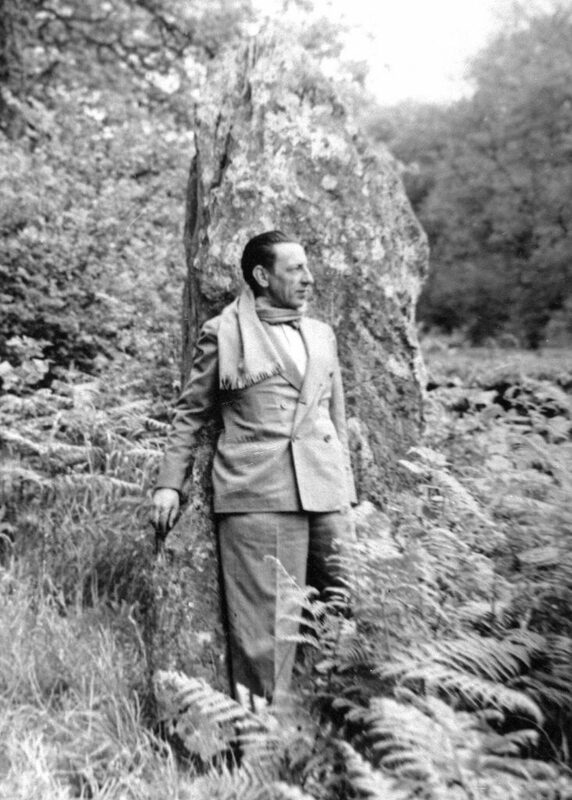 Munro bought the collection of his work and would share it with a generation of British artists. There are watercolours by both men on display in the exhibition. Turner was exposed to John Robert Cozens’ landscapes whilst working at Munro’s informal academy with his friend and contemporary, Thomas Girtin, in 1795. Turner would later acknowledge the importance of Cozen’s works on his own development as an artist. JMW Turner would famously break free from the confines of convention and tradition recording impressions of the elemental in nature. Walter Fawkes of Farnley Hall, Yorkshire, was a man with a patriotic disposition and an important patron to Turner. His son, Hawksworth Fawkes, watched Turner as he painted ‘A First Rate Taking in Stores’ and would write ‘He began by pouring wet paint onto the paper until it was saturated, he tore, he scratched, he scrabbled at it in a kind of frenzy and the whole thing was chaos – but gradually and as if by magic the lovely ship, with all its exquisite minutia came into being’. 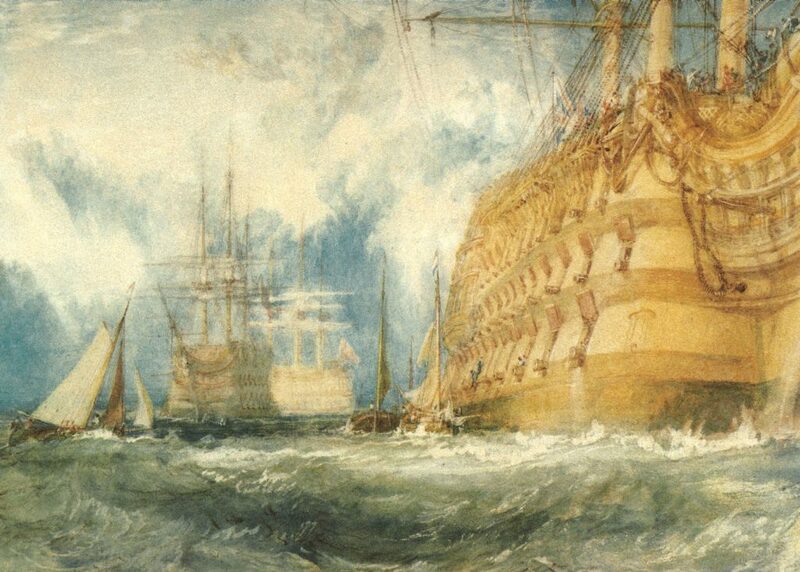 As you observe this watercolour in the exhibition it reveals depth and detail which contrasts with the scale, atmosphere and movement which Turner’s technique creates. The exhibition also looks at the topographical recording of landscapes and buildings which would come to define a sense of British identity. 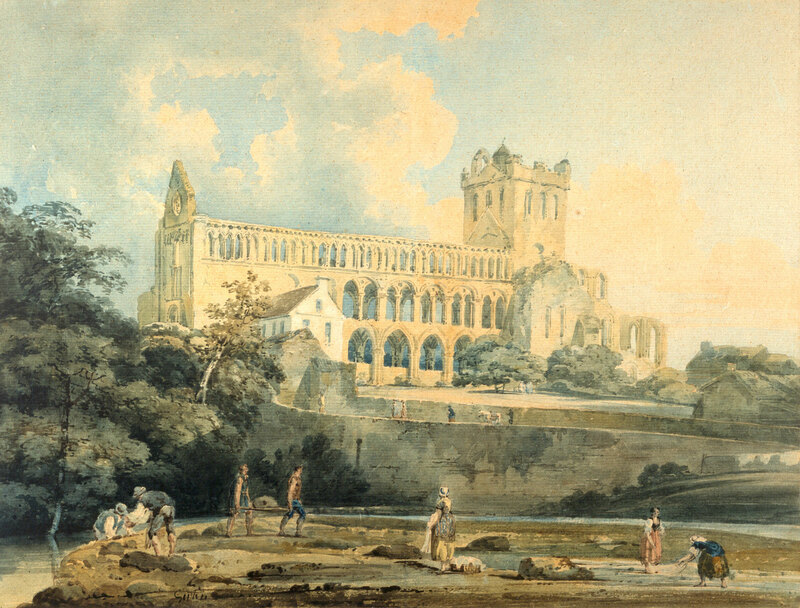 Thomas Girtin’s topographical study ‘Jedburgh Abbey from the River’ combines a delicacy of topographical recording with broad washes of strong colour which are typical of his later more spacious, romantic works. Turner held Girtin’s work in the highest regard. The exhibition also seeks to explain the influence of recording the Grand Tour on British watercolour painting. Artists like Francis Towne, who was a contemporary of John Robert Cozens, were employed in the late 18th century to record the scenes of the Grand Tour as they travelled with their patrons. 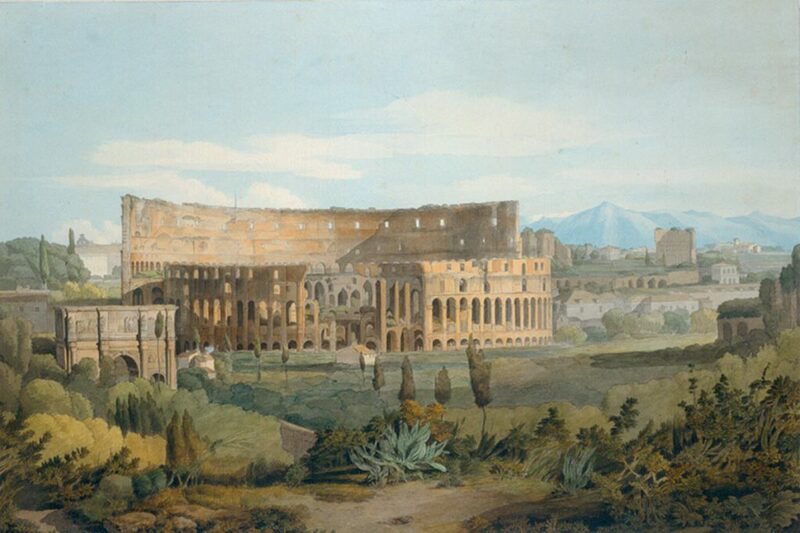 I love the delicacy of Towne’s watercolour ‘The Colosseum from the Caelian Hills’. It is based on studies in his sketchbooks from his European travels in the 1780s. ‘Turner and the Age of British Watercolour’ is a visually beautiful show which will delight you. The exhibition runs at Petworth House in West Sussex until the 12th March 2017. Entry is by pre-booked timed tickets which can be purchased online at www.nationaltrust.org.uk/petworth or by telephoning 0844 249 1895. Discounted tickets are available to National Trust Members. The first ever retrospective of the important Sussex artist, Vanessa Bell (1879–1961), is the latest exhibition to go on show at the Dulwich Picture Gallery. This timely exhibition seeks to place Bell’s work in the context of her life with over one hundred paintings on display. The story of Vanessa Bell’s life has often overshadowed the work which it inspired. But throughout her life she devoted herself to her painting which allowed her to voice her belief in the importance of substance and freedom. Her home at Charleston in Sussex remains a moving testimony to her life – a house transformed by her art. In London Vanessa Bell had married the art critic Clive Bell and was one of the leading members of what would become known as the Bloomsbury Group. She worked in the Omega Workshops with Roger Fry and collaborated with Duncan Grant in numerous decorative projects and artistic commissions. Both men would eventually become Vanessa’s lovers. Many of her designs embraced the new artistic ideas from the Continent. The abstracted fabric design for the Omega Workshops in watercolour seen here is striking in its modernity but maintains a fluidity underpinned by the use of colour in the composition. 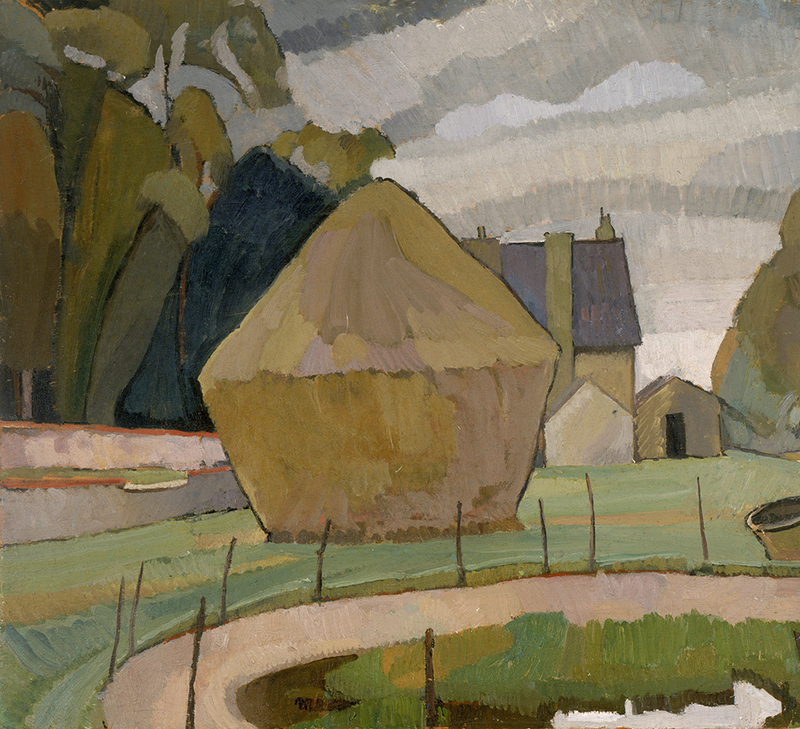 Vanessa Bell visited her sister Virginia Woolf at her Sussex home, Asheham, in 1912 where she painted ‘Landscape with Haystack, Asheham’. Here the influence of the Post-Impressionist exhibitions of 1910 and 1912, organised by Roger Fry at the Grafton Gallery in London, are readily apparent in the way that she employs light, blocks of colour and bold outlines. 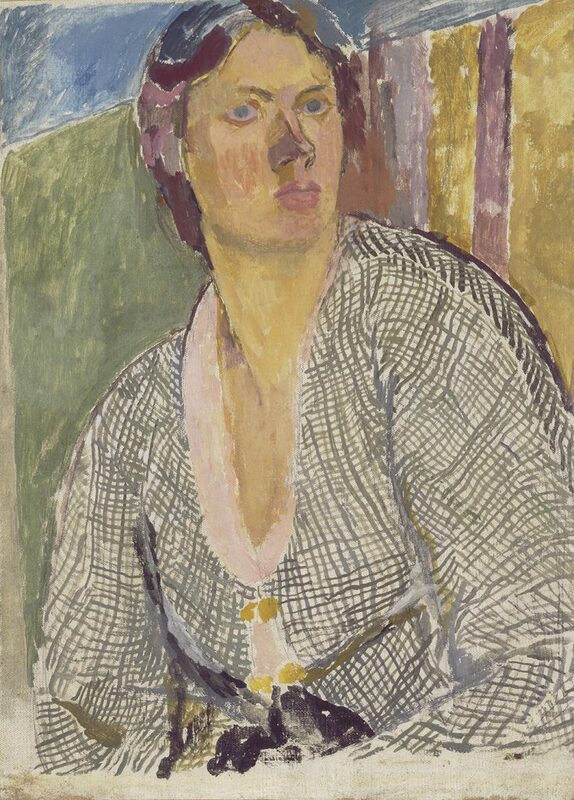 It was Vanessa Bell’s love for Duncan Grant and Virginia Woolf which brought about her move to Sussex during the First World War. Vanessa was living with Duncan Grant, and his friend David Garnett, at Wissett Lodge in Suffolk when Virginia Woolf, wrote to her. In her letters Virginia explained that not only did Charleston house need a tenant but that the neighbouring farmer was short of ‘hands’ to work on the land. 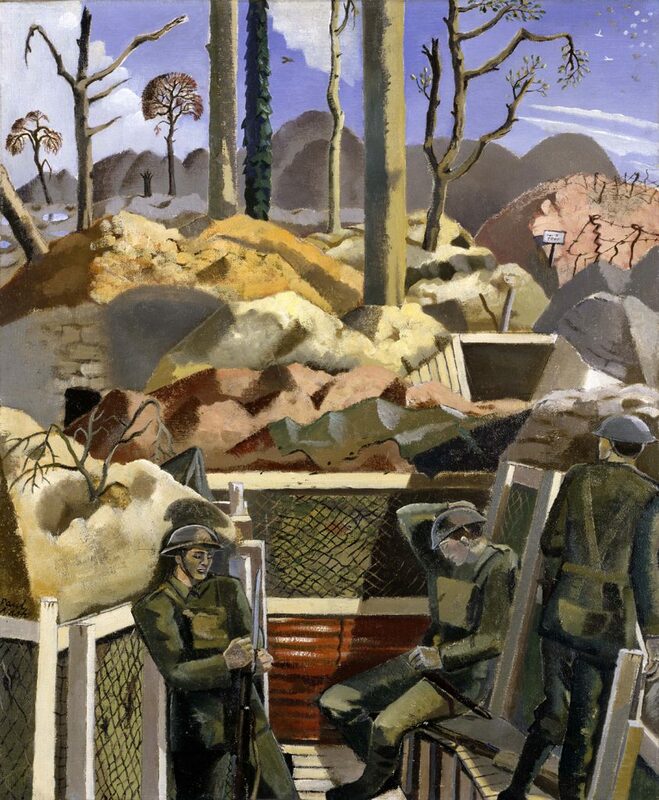 Duncan Grant and David Garnett needed to be essentially employed on the land to avoid being called up to fight or the prospect of gaol as conscientious objectors. As well as covering the walls and furniture at Charleston with painted decoration Duncan and Vanessa portrayed those who visited and the countryside around them. A number of remarkable portraits by Bell are included in the exhibition. Her paintings of Virginia Woolf, Lytton Strachey and David Garnett are revealing and remarkably daring in their execution challenging our perception of the world and beauty. Amongst these is a self-portrait painted in 1915. Vanessa sits in a chair her head averted from us as she stares from the canvas deep in thought. There is a strength and resilience in her demeanour. I have always loved the intimacy of Vanessa Bell’s still lives. The study of wallflowers does not disappoint. 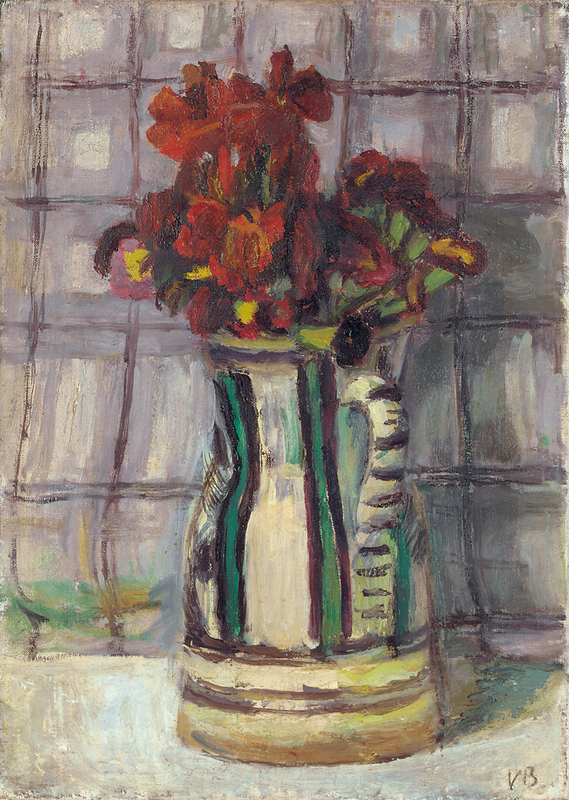 The flowers sit in a jug which may well have been decorated by Vanessa at Charleston. 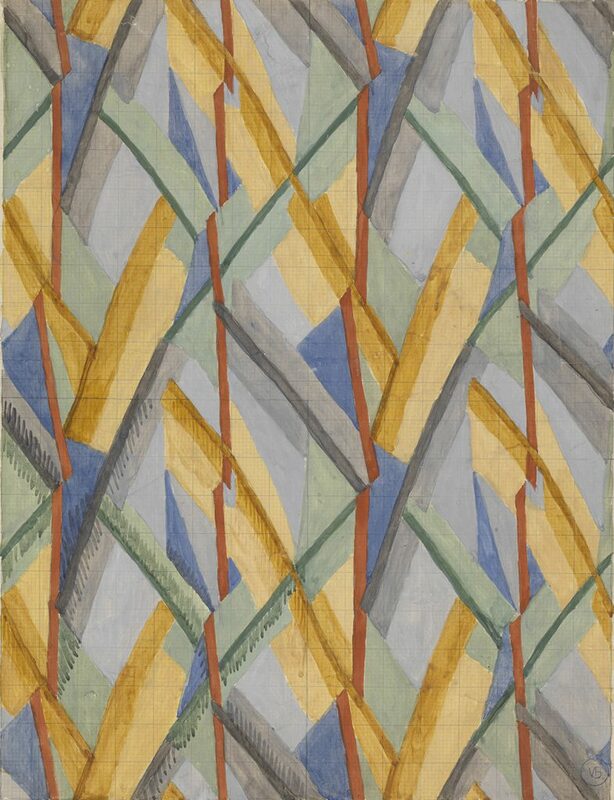 This superb and long overdue exhibition allows us to see Vanessa Bell’s development as an artist and the techniques, themes and subjects which unite her work. ‘Vanessa Bell’ runs at the Dulwich Picture Gallery until the 4th June 2017 and is one of this year’s must see exhibitions. For more information go to www.dulwichpicturegallery.org.uk. 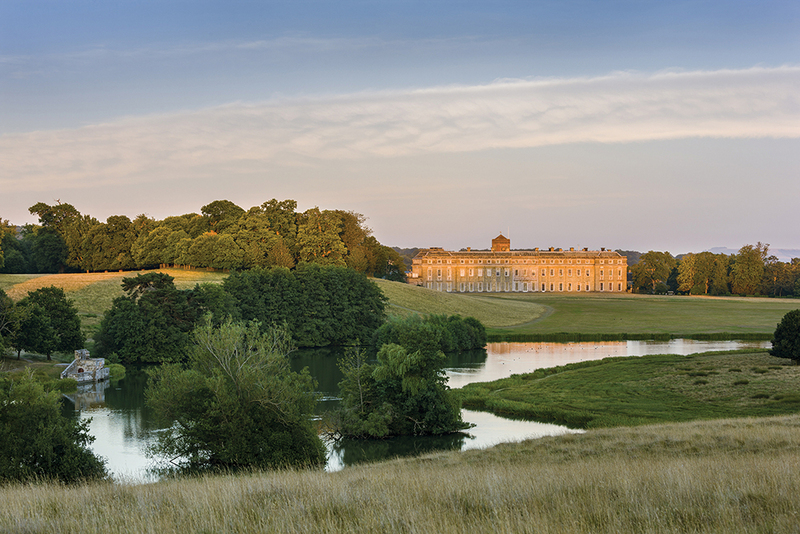 Capability Brown’s very English landscape at PetworthAs a New Year begins it gifts us with a moment to reflect on the rich identity of our county and the role heritage and the arts have in re-telling the common stories which we all share and which bind us together. Over the millennia when the English, a diverse race, have needed to define themselves they have returned to their monarchy, their landscape, their history and their church, as well as the qualities of service to others, tolerance and fairness. 2016 seemed to epitomise these themes and qualities. 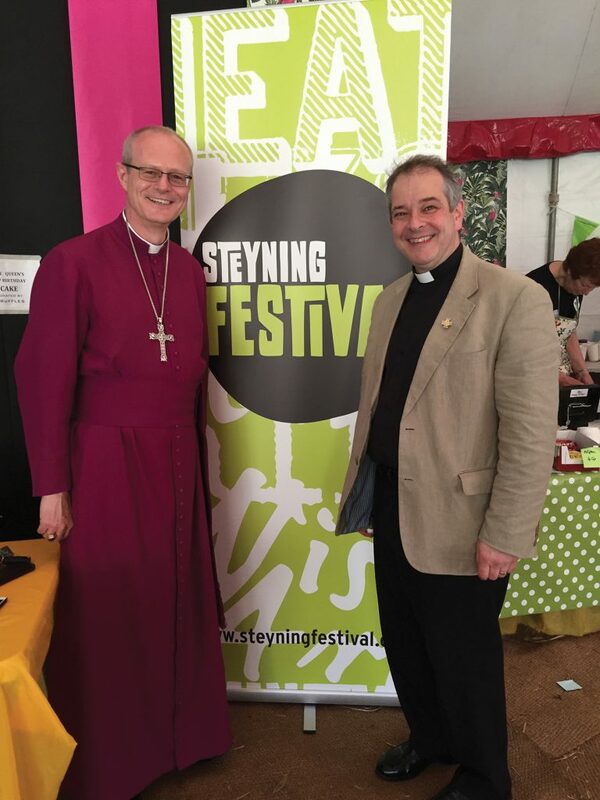 We celebrated HM Queen Elizabeth II’s 90th birthday with church services and festivals. 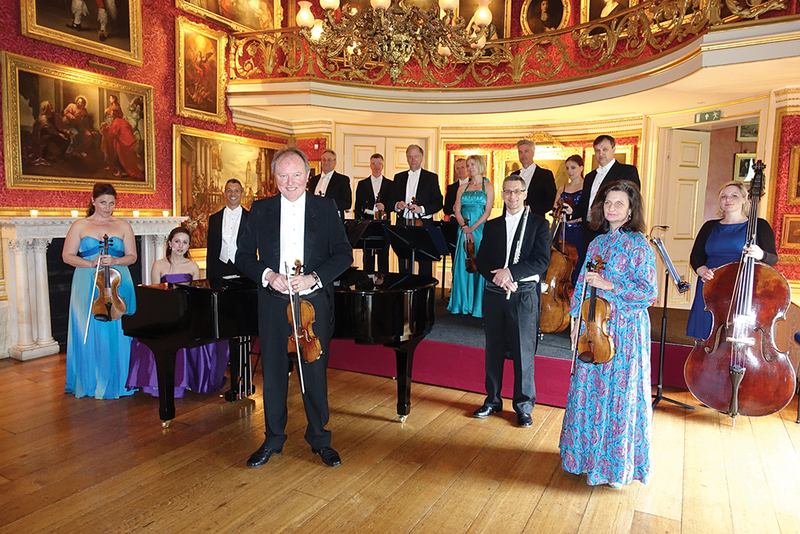 Our hospices were celebrated and supported by a fund-raising concert given by the Bernardi Music Group at Goodwood House. New and traditional music celebrated the Sussex landscape. 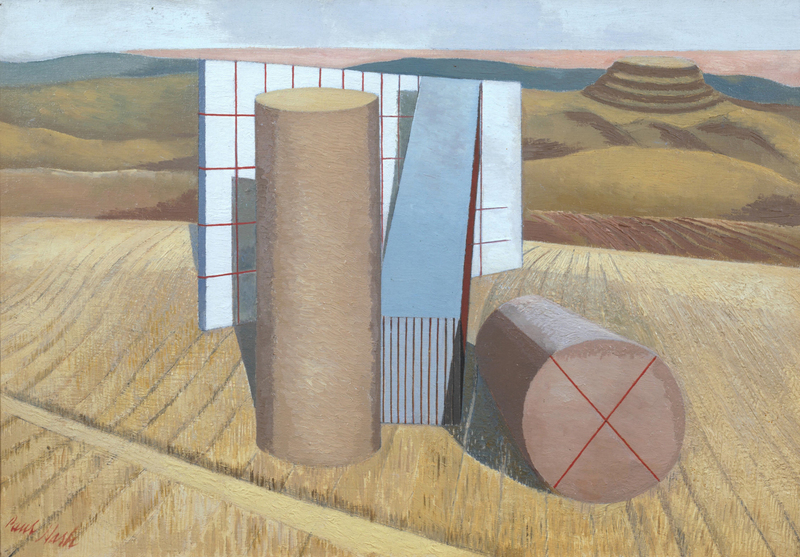 In reaction to the industrial revolution and war from the late 19th and 20th centuries onwards there was a desire to articulate the ancient hope of the English expressed in and through their landscape. A hope bound up with a romanticized view of a rural idyll, lost or under threat. 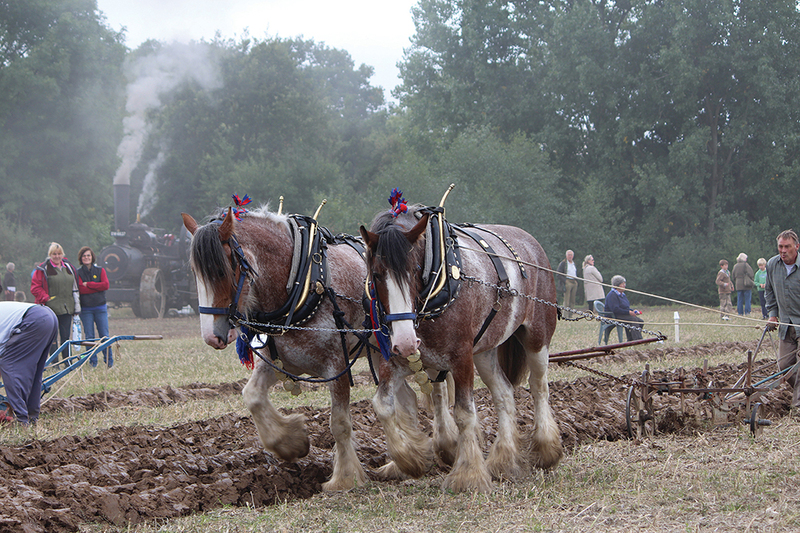 The West Grinstead & District Ploughing & Agricultural Society was founded in 1871 and its Annual Ploughing Match and Country Show still seeks to honour countryside traditions and learn from the past whilst looking confidently to the future of farming in Sussex. The 300th anniversary of the birth of Lancelot ‘Capability’ Brown (1716-1783), the famous landscape designer, allowed us to focus on the beauty of our Sussex landscape with exhibitions at The Horsham Museum, curated by Jeremy Knight, and by Tom Dommett, the National Trust’s Regional Archaeologist, at Petworth House and Park. It has never been more important for us to be confident of who we are – to remember our shared story. It is this generous and outward facing identity which will bless us and our county with hope and opportunity in 2017.